Software copyright violation ("Piracy"), involves creating unlicensed duplicates of computer programs, then selling them or using them, even as authentic items. Software application programs that are used without the permission of the owner/manufacturer or obtained illegally are often called pirated software, the proper term would be unlicensed software. It is illegal in the United States and in most countries. According to the Business Software Alliance (BSA) 2009 report, approximately 41% of all personal computer software is installed illegally. The loss to software vendors is about $50 billion. This types of estimations are intrinsically prone to errors. First the source of the reports have an invested interest in amplifying the problem and the cause, toward the goal calling attention to the issue and doing so generate supportive legislation. Second, it implies that not only that the numbers are accurate but that all detected illegal uses directly signifies missed revenue. Copyright violation is often represented as theft, this is factually incorrect since nothing is directly subtracted from the owner. It is an infringement of the owner rights that can indeed cause monetary loss by depreciating how the public views the product, since copies may be of inferior quality or compromised (include virus) and reduce legitimate sales (this is however somewhat counter balanced by increased public exposition). With the widespread violation of copyright, due to the intrusive types of protection schemes, bad legislation and unrealistic duration of copyright, owners and manufactures do not get direct and guaranteed return for their creative work. Programs that have high costs are industrially duplicated used illegally or pirated, this also means that states can not tax these sales. 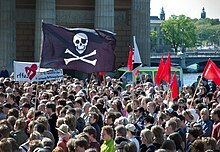 After interviewing 15,000 computer users from 33 different countries in early 2012, the Business Software Alliance found 57% of the world computer users acknowledge to using pirated software. Most of the users of pirated software are young males in countries with developing economies, such as Venezuela, China and Thailand. With the expansion of global markets, it is essential that businesses audit their software to lower their risk for copyright violations. Sarbanes-Oxley requires company officers to confirm the integrity of all financial records and to ensure the proper internal controls are in place. Should a company be found guilty of copy right violations the penalties include $150,000 fine per violation and possible prison time for the officers of the company. One form of defense that right owners (firm or author) of software can use to deter criminals from unlicensed duplicating software is Copyright. This is protection available to the rights owner of a software program, a book, movie, etc. Having this protection gives the author exclusive right to duplicate it. A copyright, depending on local legislation, may last for 95 years of publication or 120 years since the date it was created, whichever comes first. This page was last edited on 22 February 2013, at 02:26.